Breakfast at the Hacienda El Divisadero, a cheese sampling and a Raicilla (or Mexican moonshine) tasting had already sensitized me to an authentic Mexican experience. Now it was time for a real nature experience. Expert local guide Jesse Morales and I hopped into a truck and drove for about 10 minutes to a more remote location on the property that is a true testimony to the long history of this area. 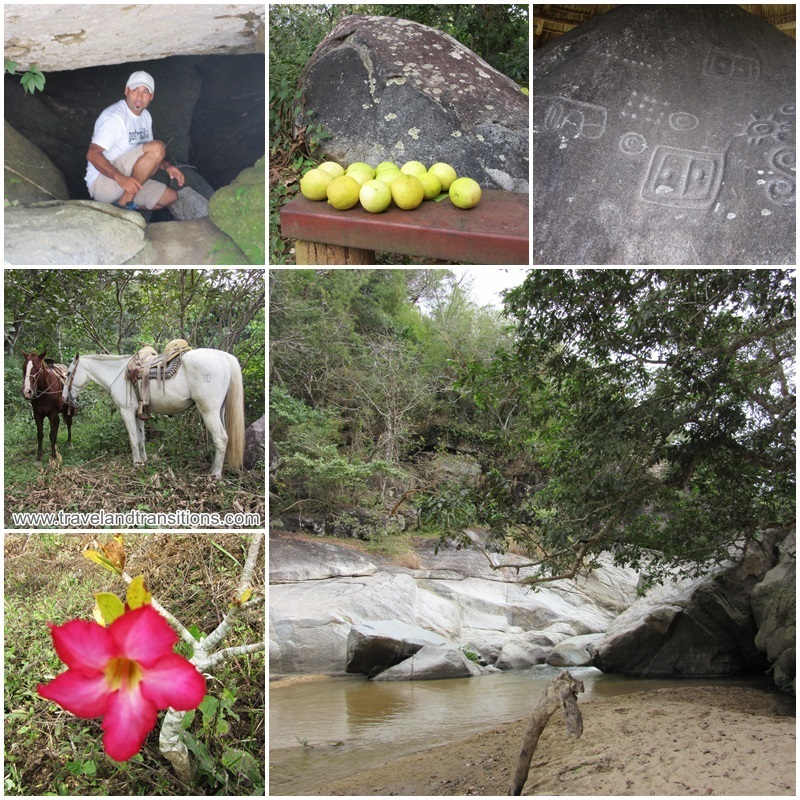 A huge rock has been inscribed with ancient petroglyphs that were created long before any Spaniards ever arrived in Mexico. The symbols are hard to decipher but probably relate to nature and the agricultural calendar. Then we walked for a bit down to a river. Jesse explained that we were at Las Guásimas, a picturesque river gorge with interesting boulders, rock walls and a small sandy beach. As evidenced by his earlier encounter with a small iguana that was hanging off his earlobe by its teeth, Jesse loves nature and wild animals. And in one second he was gone and up on the rocks, darting inside small caves, on the lookout for bats. There were no bats to be found, but in one of the caves he located a huge number of long-legged spiders. Excited to have finally found some animals, he fearlessly climbed into the cave and came back down to the beach, covered all over by daddy longlegs. Of course, I am no great lover of spiders, so that was enough to freak me out. This was the moment when I started calling Jesse “the Mexican Crocodile Hunter”. If there had been any crocodiles here I am sure he would have found them! After this river visit we walked back to the Petroglyphs. Santiago, another employee of Hacienda El Divisadero, was waiting there with several horses and I got to pick one for the ride back. I picked Lucero, a beautiful white mare with a reputation for gentleness, something I dearly needed. 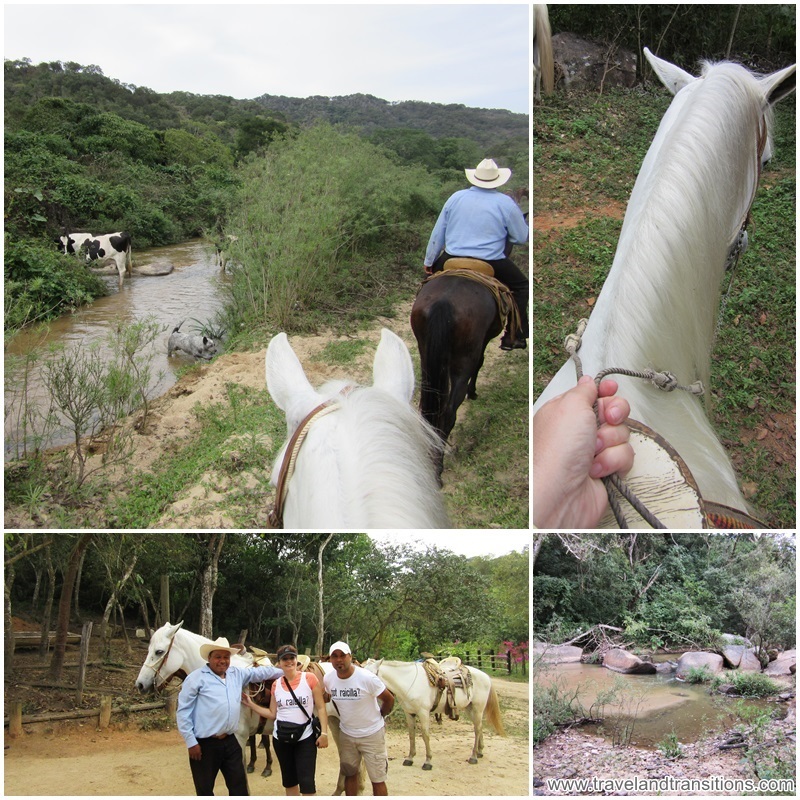 Four rider-less horses were at the front, then came Santiago’s little dog, next was Santiago himself, then me, followed by Jesse, the Mexican Crocodile Hunter. To start we were riding down a steep rocky embankment to the river. I was filming the entire event, so holding on to the horse with one hand and the camera with the other was rather precarious. Several times I thought I was going to fall off my lovely horse. The path was very steep and full of boulders and roots, but all the horses were treading along rather nicely, easily navigating all the obstacles. I, on the other hand, got bumped around quite gracelessly like a sack of potatoes. Lucero seemed to be quite hungry, so she would regularly bend straight down or stretch her head to the left or right to catch a few leaves, which made for a bit of an exciting and wobbly ride. As we were riding along Santiago pointed out a “chicle tree”, and cut it with a machete. White liquid was oozing out of the cuts and Jesse explained that this sap is used for bubble gum production. We crossed the river several times and at one point we startled a couple of cows who seemed quite irked at the disruption and ran away from us into the river with raised tails, kicking their hind legs. From here we slowly made our way back to the stables at Hacienda El Divisadero.